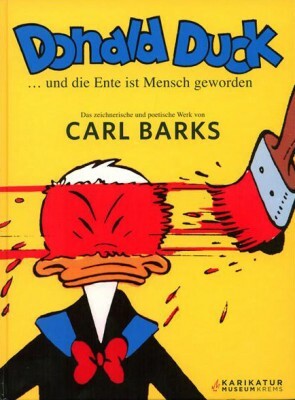 "Donald Duck ... and the duck became human" is the title of the exhibition about the drawings and poetic work of Carl Barks at the Caricature Museum Krems (Lower Austria) from 25 March to 4 November 2007. Barks, who is one of the most eminent American artists of the 20th century, was a leading cartoonist of Walt Disney. He made Donald Duck a highly popular character and created duckdom with his unique style and original stories. He is considered the inventor of Uncle Scrooge, the Beagle Boys, Gladstone Gander and Gyro Gearloose and other inhabitants of duckdom. His creative work had a lasting influence on artists like Roy Lichtenstein, Andy Warhol, Robert Crumb and Manfred Deix. Film directors such as Steven Spielberg and George Lucas also expressed their admiration for Barks.